This neckerchief was made for a doll, known as Lord Clapham, that is thought to have belonged to the Cockerell family, descendants of the diarist Samuel Pepys (1633-1703). The daughter of Pepys's nephew John Jackson (the son of his sister Pauline) married a Cockerell, who had a family home in Clapham, south London. Lord Clapham offers a fine example of both formal and informal dress for a gentleman in the 1690s. His formal outfit includes a coat, waistcoat and breeches, while his informal dress is represented by the nightgown. Accessories such as the stockings, stock (a form of stiff, close-fitting neckcloth) and gloves are very valuable since very few items from this early period survive in museum collections. Equally important is the demonstration of how these clothes were worn together. Dolls were widely produced in the 17th century, although very few survive, due to the wear and tear they usually undergo. The high quality of Lord Clapham and his clothes indicates that he would have been expensive. There is little evidence of use, which suggests that he was admired by adults rather than played with by children. Doll's neckerchief of fine linen fringed with yellow silk threads at each end. It is worn in a 'Steinkirk' fashion with the ends wrapped around each other and drawn through a buttonhole on the coat. The doll and its partner are thought to have belonged to the Cockerell family, descendants of Samuel Pepys. The daughter of Pepys' nephew, John Jackson (son of his sister, Pauline) married a Cockerell. The doll and its partner were named 'Lord' and 'Lady' of the family home in Clapham. Historical significance: The doll and its partner are costume documents; their clothes being, in style, cut and material, perfect miniatures of the fashions of the late 17th century. Their importance is underlined by the almost total lack of other good visual material for this period, whether pictorial or in the form of surviving garments. In particular, the survival of accessories and the informal garments is extremely rare. The plain linen neckerchief replaced the heavy lace cravat in the last decade of the 17th century. The term 'Steinkirk' or 'Steenkirk' refers to the battle of Steenkirk in Flanders in 1692. Legend has it the officers were in too great a hurry to tie their neckcloths correctly and just poked the ends through a buttonhole. The French won the battle and started this new method of fastening a neckcloth which spread to England and the rest of the continent. Dolls were widely produced in the 17th century, although very few survive. It is most unlikely that this particular example was the plaything of children. The production is of a high quality, almost all the accessories survive and there is little wear and tear on the dolls and their garments. The two dolls were most probably purchased for the amusement of adults, and as a decorative accessory to a home. These dolls were named 'Lord and Lady' of the family home in Clapham, London by their owners, the Cockerell family. The outfits of the dolls are perfect miniatures of London fashions 1690-1700. Lord Clapham's coat, waistcoat and close-fitting breeches demonstrate the newly fashionable three-piece suit. At this period the suit was not expected to match. 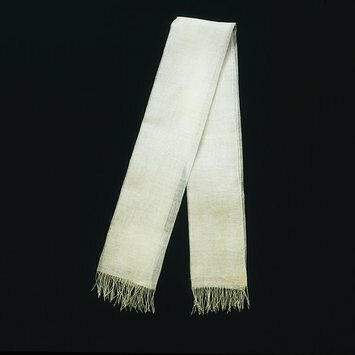 The neck-cloth is worn in fashionable, military style.